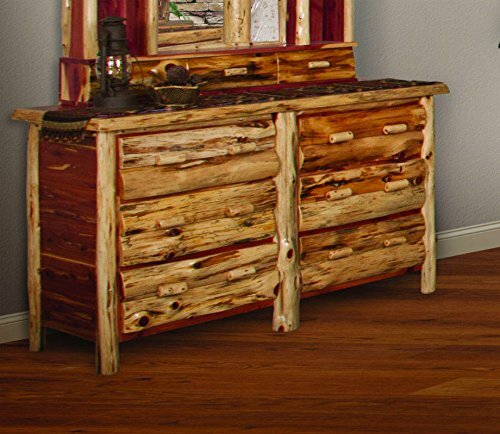 Nothing at all compares to the unique scent and elegance of normal, hand-crafted rustic Red Cedar Log furnishings. An superb option for a rustic mountain lodge, ski cabin, nation cottage, and much much more. 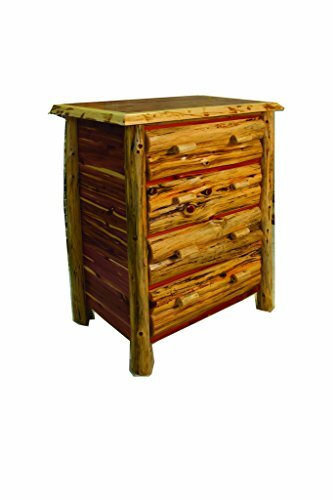 Red Cedar logs have a stunning light tone on the outside and striking vivid red cedar coloring on the inside. 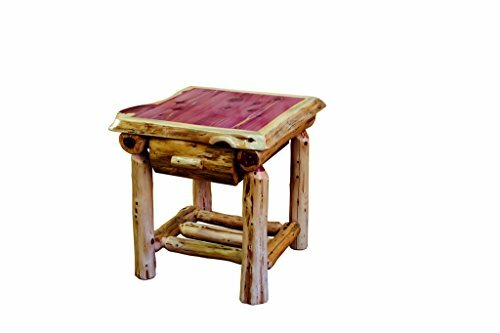 Constructed by experienced Amish craftsmen, our products are sanded and lacquered for beauty and durability. Sturdy and considerable, these items will last generations. NOTE: See final photo for checking example. 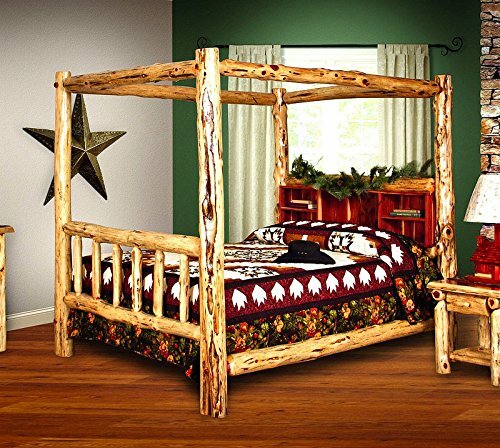 Checking Info: Cedar Log furnishings is topic to the natural procedure of checking as the wood \"seasons\" and dries. Checking takes place as wood releases moisture across or through the yearly development rings - it does not affect the structural overall performance or the integrity of the wood. Checking adds distinctive elegance to the log furnishings. Various quantities of checking could arise on any provided piece of cedar log furniture and cannot be managed by the builder. Checking is not an indication of damaged furnishings. NOTE: In the photographs the hutch is featured with a mirror. Due to the probability of damage in the course of transportation, the mirror is NOT Included in this listing. 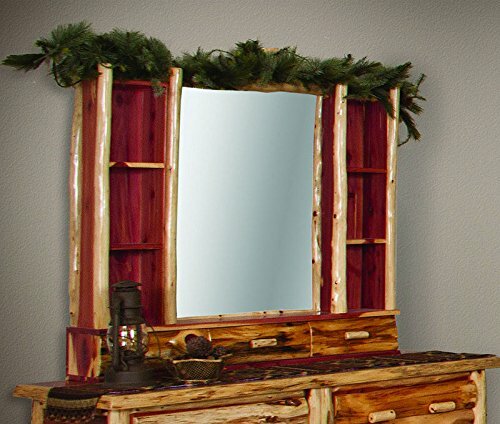 The hutch supplies a frame for the mirror. Please make contact with a regional vendor for customized minimize mirrors. 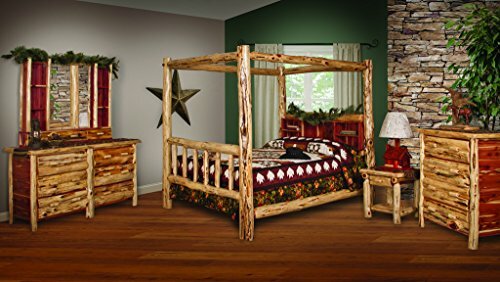 Beautiful 5-piece red cedar log King Canopy bedroom furniture set. All custom made. Professionally applied lacquer finish for added beauty and durability, Amish made, Complete with King size canopy bed, 6-drawer dresser with hutch (not including mirror), 4-drawer chest, and 1-drawer nightstand, Mortis and Tennon Joinery, Substantial and Sturdy Approx. 6" Diameter Red Cedar Logs, Due to variability in logs, each bed will be unique, may vary from photographs. Mattress, lamp, mirror and decorations not included. Proudly made in USA. Dimensions as follows...King Bed: 84"W x 89"L x 80"H, 6-Drawer Dresser: 64"W x 23"D x 34"H, Hutch Mirror: 50"W x 38"H x 7"D, 4-Drawer Chest: 36"W x 23"D x 43"H, and 1-Drawer Nightstand: 23"W x 23"D x 24"H.